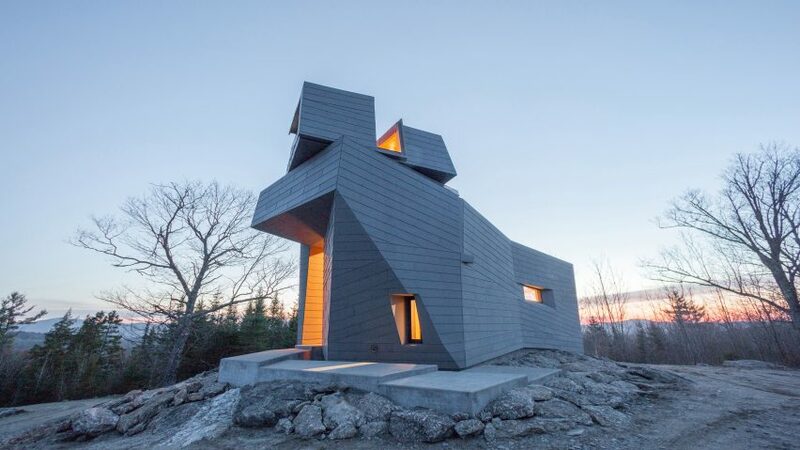 The top of this faceted private observatory in central New Hampshire, by Anmahian Winton Architects, rotates to provide different views of the night sky. 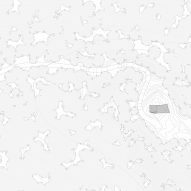 The Gemma Observatory sits on a remote peak in the northeastern state, at the centre of a "dark" zone with a three-mile radius. Unobstructed by light pollution, the setting is ideal for astronomical observation. Unlike typically domed observatories, the building has an angular form designed to echo its jagged granite surroundings. Lock-seamed zinc used to clad its exterior references the hues of the rocky landscape. "[The building's] dimension, colour, and patina evoke a material relationship to the grey granite outcroppings," said Anmahian Winton Architects, based in Cambridge, Massachusetts. 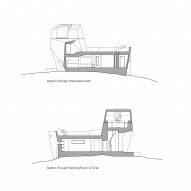 The small structure comprises a low portion and an adjoining tower, all wrapped by the faceted metal skin. A terrace of concrete platforms leading to the entrance forms part of the foundations, and also visually mediates the bedrock and the building. In contrast, the interior is lined with fir plywood to create a cosy escape from the chilly environment outside. The walls are thoroughly insulated to prevent heat exchange between outside and in, which produces heat eddies in the air that can impede the view of the stars. Designed to accommodate a single occupant, the ground floor has enough space for a research office, a sleeping bunk, and a warming room. A helical staircase leads up to a deck across the top of the single-storey portion, and continues up to the observation platform inside the turret equipped with a large telescope and a camera array. "A single person can rotate this turret by hand with an assembly typically used in high-precision manufacturing facilities, and a hand-cranked sliding hatch opens the telescope to the sky," the studio said. A gap in a corner of the cladding frames Polaris – the North Star – when the tower is locked into its southern cardinal position. 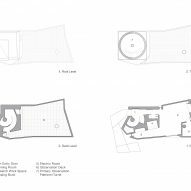 Gemma Observatory was a winner of the AIA Small Projects Awards 2017, along with student-designed cabins in Colorado and a transitional housing facility for pregnant or parenting women in Oregon. A similarly compact observatory is located in Kielder, Scotland, but features two rotating towers rather than one. Structural engineers: RSE Associates – Sofya Auren P.E.